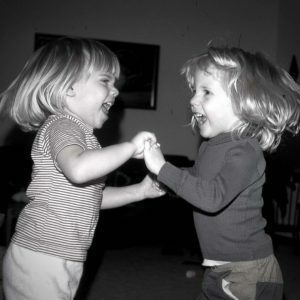 I pause to take in this photo with my sister (right, age 3) and I (left, age 2). What captured my attention is the look on our faces. The emotion – the joy, the smiles, the bouncing hair from dancing. This is Alive. What does it take for us as we age to feel this way? I’ve felt physically Alive after cycling 102 miles or when I hung with the pack on a 50 mile road race. That was a feeling of physical aliveness. I feel mentally Alive when I have pushed myself to learn something new, expanding my mind, or a new mental task. I read a 1,087 page (small print!) book for pleasure – the longest book I’ve ever read. Something small but new and it felt good. Or a greater mental accomplishment was the consistent discipline for ten months reading Og Mandino’s Scrolls three times per day- morning, noon and night. But an even more important aspect I have discovered is the feeling of being Alive in my soul. I found this while working on a creative project to help a little girl I met in Cuba. I was following my heart, being led by faith, and while pursing the cross, I found the feeling of Alive. It all started from being inspired to help someone. And for months, little by little, spending time over photos, from a start point of an idea, asking, not knowing, seeking, exploring, being frustrated, having road blocks, keeping going, persevering, taking time—a discovery process and sense of accomplishment. Somewhere in the midway point of this project, my spiritual journey growing, dining room table covered in prints, papers, ideas, I had the bubbling up of a new feeling—it was the sense of Alive. My soul and spirit was talking to me- a soft assurance that bubbled up… Alive. What a discovery. This was one of my 3 words that called to me in January 2016- Live, Breathe, Alive. Yes- I am finding You! No more hiding. It takes from within the inner for the outer to shine. ”This little light of mine, I’m gonna let it shine.” I am trying to fully shine. Maybe I’m feeling this increased aliveness because I’ve been selfish for most of my life. Sure, I helped people in my twenty-year plus career in human resources and yes, I gave money to charities here and there, but what did I…me… Amy, solely do, act upon, create something of value, to help another? I think it takes us pushing our own self to feel the power of Alive. I think it takes us following faith, helping others, and doing something to make a difference, with nothing asked in return for our spirit and soul to come Alive. What makes your spirit come Alive? LIVE your inspiration! BREATHE in faith! Be ALIVE in your calling!